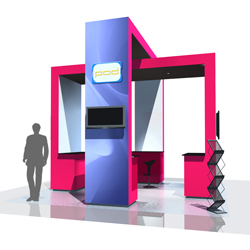 What is a Modular Exhibition Stand? Modular exhibition stands are a versatile form of display system suitable for all types of exhibiting. Modular displays are designed for flexibility and reusability and can be configured to include only the elements you need on your display stand. The custom components and quality graphics allow you to create a unique stand without the costs involved with bespoke stand designs. What is the difference between Centro and Esetta stands? We have selected 3 of our bestselling modular systems to discuss in this article. A brief summary of the key features of these modular displays are listed here. This however is not an extensive list, so please call our sales team with any specific questions you may have. •	Simple to construct using allen key tool, larger displays we supply a cordless screwdriver. •	Versatile frame- Option of slatwall backdrop or doors easily added. •	All shapes and sizes can be created. •	Create other features including flat, curved or sliding doors. The Centro modular system is our best selling exhibition display at POD Displays. It is especially suited for exhibition displays that incorporate multimedia displays and digital signage. If your requirements are very specific we recommend the Esetta Modular Stands for the greatest flexibility. We can provide a 3D CAD render with each quotation to help you visualise the end result of your modular system. Call our sales team on 01933 411159 or e-mail your enquiry to us today.